Come train at the top goalkeeper school in South Texas! 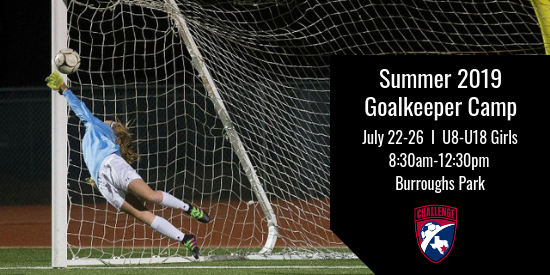 This extremely popular and comprehensive program is staffed by Challenge Goalkeeping Director, Chris Maravalli, and his excellent team of collegiate goalkeeper coaches and players. Topics covered include: Basic and Advanced Shot Handling and Footwork, Collapse and Extension Diving, Breakaways, 3-Goal Scenario, Cross Assessment and Handling, Communication, Distribution, Set Piece Organization and Video Analysis. Payment: Once you click SUBMIT at the bottom of the form you'll be directed to Stripe to pay by credit card. If you would prefer to pay by cash or check, simply close our your screen AFTER you click SUBMIT. Your registration will still go through if you don't pay via credit card. Mail Checks (made payable to Challenge Soccer Club): Challenge Soccer Club, 16720 Stuebner Airline Rd., #279, Spring, TX 77379; be sure to put your daughter's name in the MEMO of the check.